They say that there is no such thing as spoiling a newborn baby. So if your baby is having trouble settling down for the night (or more likely, a few hours) it’s perfectly okay to help them with some gentle rocking. Newborn babies love to be rocked to sleep. Once they seem nice and sleepy, check their arms to see how relaxed they are. If her arm is limp, then she is good to put into her crib. If it’s a little stiff, she maybe needs a few more minutes rocking. 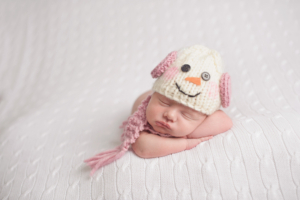 Setting a routine early on (after the newborn stage), is so important in helping teach baby that its time to sleep. If you can, try getting babies under 1 year to bed before 7pm. Babies love a warm soothing bath, as well as some soft music, or for older babies, even a quick relaxing bedtime story, told in a soft soothing voice. A classic bedtime book such as “Goodnight Moon” can help lull an older baby to sleep. If you can, turn the lights down low and try to cut out and loud noise. A lot of babies will wake for their night feed beyond the newborn stage. Try to keep the lights low and don’t make too much noise. If you can, put baby back into bed still awake as this will help her learn to fall asleep by herself. Make sure that baby’s room is not too hot or too cold. Ideally the temperature should be between 65 and 75 degrees Fahrenheit. If necessary, in the summer use a fan or air-conditioning. Some babies even benefit from the use of a humidifier. To help baby adjust her body clock to associate darkness with sleeping and light with waking, try to keep the nursery as dark as possible during naps and at night. Buy heavy curtains and use only a small light night that isn’t too stimulation for baby. When sleep time is over, open the curtains and let the light in. Some babies really love a gentle massage and it can help them fall asleep quickly. Try using a small amount of a mild-smelling baby oil, and use soft gentle strokes. Be warned though, for some babies it can be too stimulating, and may have the opposite effect. If baby starts to squirm and giggle, perhaps you should move onto a different relaxation technique! If you live in a noisy house or neighbourhood, think about getting a white noise machine (we swear by ours!) There are loads of different types and you don’t need to spend a lot of money. A fan also does the trick in the hotter months.